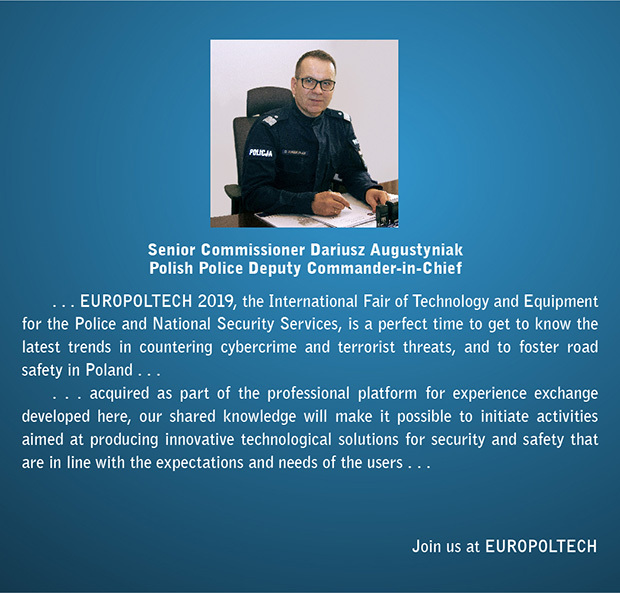 The International Fair of Technology and Equipment for the Police and National Security Services EUROPOLTECH is Poland’s most important trade event dedicated to law enforcement and special services. This highly-specialised show is organized by the MTG SA Gdańsk International Fair Co. in close partnership with the General Headquarters of the Polish Police and in collaboration with the services of Poland’s Ministry of the Interior, national security services, Special Operations and Military Gendarmerie. EUROPOLTECH is dedicated and open only to expert professionals: Police Conference participants, representatives of Polish and international Police, civilian and military national security services, lawmakers and public officers who address security issues. Last edition was attended by more than 4000 trade visitors. We provide excellent presentation conditions for your products, both indoors, in EXPO XXI Warsaw in Prądzyńskiego 12/14 street. We also provide specialist security services to protect the exhibition grounds, in keeping with the nature of the event. Make sure to take advantage of your guaranteed access to the EUROPOLTECH side events: conferences, presentations and the 2019 edition of the SUPERMODERN Programme, which promotes the unique operational qualities and novel technical solutions of the equipment presented at the Fair. The 9th International Police Conference is organised by the General Headquarters of the Polish Police. Invitees will include the executive staff of European police services, EUROPOL and INTERPOL.